Crown Heights is known for its Caribbean food, the best of which may be the enormous roti from Gloria’s. If you somehow manage to miss the bright green signs that beckon for you to enter this counter-service shop on the corner of Sterling and Nostrand, then look for a long line pouring out onto the sidewalk amid the aroma of curried meat and sweet dough. For the uninitiated, roti is a popular Trinidadian dish with a distinctly Indian flare. It gets its name from the eponymous South Asian flatbread that’s used as the vehicle for these heaps of curry. Unlike naan, roti is thin and crepe-like; dhalpuri roti tends to be on the dense side because of its layer of mashed yellow split peas inside. At Gloria’s, it comes as a football-sized burrito filled with big bites of spiced potatoes, whole chickpeas, and usually a curried meat of some kind, all swaddled in a huge piece of dhalpuri roti. 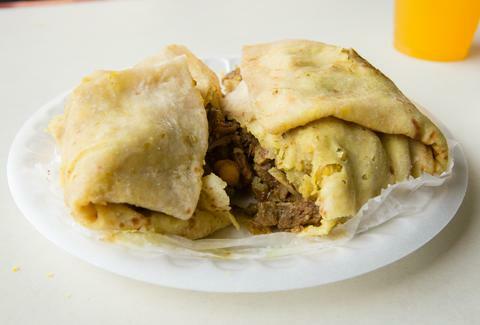 The curry goat roti ($8.50) is one of the most popular flavors on the menu (his holiness Anthony Bourdain even gave it a try during his visit with the TV show No Reservations). The succulent goat is cooked in a spice-packed turmeric-forward curry that clings to the chunks of meat. It’s just saucy enough to ensure the potato and chickpea filling is never dry. That’s not to say that this roti in particular is not messy, because it is... especially when you add the tangy tamarind sauce -- and, if you’re feeling up to a challenge, the vinegary, vaguely fruity, so-spicy-it’s-orange hot sauce. In their 19th-century indentured servitude, Indian sugarcane farmers came up with rotis to make curry an on-the-go meal, but at Gloria’s the goat meat is still attached to the bone, so you might want to sit down with a fork. If you actually want to eat a roti like a giant, indomitable burrito, then the boneless curry chicken, which is comparable in price, is your best bet. Although you’ll mostly find locals rattling off their regular orders, you’ll also catch the occasional newcomer at Gloria’s, staring up at the illuminated menu of flavorful offerings. The place stays open until 10pm on most weeknights and 11pm on the weekends, so there’s plenty of time to shamelessly overeat at one of the few, tight-fitting four-tops, or on the train back home. Gabrielle Van Tassel is an editorial intern at Thrillist who always asks for the hottest sauce available then usually regrets it (though she’ll never admit it). You can follow her best decisions on Instagram.